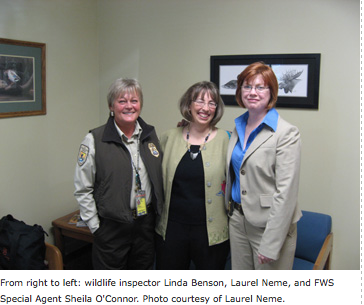 US Fish and Wildlife Service Special Agent Sheila O’Connor revealed the inside story of working in wildlife law enforcement to Laurel Neme on her "The WildLife" radio show and podcast. In the first of a two-part interview, Special Agent O’Connor talks about her adventures stopping wildlife crime—scoping out pet shops in the Chicago area for illegal tarantulas to busting a husband-wife team selling illegal pet tigers to nabbing a smuggler of literally thousands of rare and exotic animals parts from Laos—including Asian elephant, clouded leopard, douc langur, tapir and serow—for use in traditional medicine. Special Agent O’Connor is a veteran wildlife law enforcement officer, with over 20 years of service under belt. She began her career in wildlife law enforcement as a Conservation Police Officer for the Illinois Department of Natural Resources, where she served for eight years. She then moved to federal wildlife law enforcement with the US Fish and Wildlife Service, where she was first posted to Ann Arbor, Michigan, and then to St. Paul, Minnesota. During that time, she investigated several major cases that led to felony convictions for violations of wildlife laws. She now serves as a training officer at the Federal Law Enforcement Training Center (FLETC), the interagency law enforcement training organization that serves 88 Federal agencies, in Georgia. Laurel Neme: How did you first become interested in wildlife law enforcement? Sheila O’Connor: It was one of those family vacations as a kid. I grew up in the Midwest in a large family that didn’t do outdoors stuff—unless kick-the-can is outdoors stuff. We went on a vacation to the Smoky Mountains, and I had never been to the mountains. I just thought it was fantastic. It was scenic and beautiful. I [looked at] the park rangers and thought "wow, they get to stand there and look at this view all day!" Of course, that’s not really what they do. That’s just what they do in the mind of an 8 year old. But I did think to myself that someday I’d want to have a job like that. That’s what first started it for me. I’ve always loved animals. I was always begging my parents to get a pet—[like] a goldfish at the fair. It started early for me with a love of animals and then wildlife and then natural areas. Laurel Neme: What kind of work did you do as a conservation officer for the Illinois Department of Natural Resources, and how did it differ from federal wildlife law enforcement? Sheila O’Connor: It’s a lot like [the difference between] a patrol officer versus a detective. As a state conservation officer you wear a uniform every day and you’re in a marked patrol unit. I went out on boat patrols on Lake Michigan in the summertime, and also state park patrols. I checked fisherman and hunters for compliance, did boat safety inspections, did some training, and did some teaching on boat safety, hunter safety and snowmobile safety for the public. As a conservation officer, you’re more of a front line equivalent of a patrol officer. Now, with the US Fish & Wildlife Service, we do much more investigations. It’s not so much “Hi, how are you doing today? I need to check you’re fishing license.” I don’t really do that anymore. As a special agent, we handle criminal complaints, things like smuggling of wildlife and illegal commercialization—things that a uniformed patrol officer is not terribly well equipped to handle. It’s more investigative in nature than first response. A conservation officer would be more first response. Laurel Neme: What prompted you to move into the federal system, to get to be that detective as opposed to the patrol officer? Sheila O’Connor: I absolutely loved my job as a conservation officer. It was a lot of fun and it was very meaningful work. But I wanted to work on cases that could have a greater impact of the resource, on actually saving a resource. As a uniformed officer you’re limited in what you can work on. I couldn’t work on cases in other states. For example, we might have resources that were being taken illegally in one state and being brought back to the state of Illinois. That’s not something that I was able to work on. And bigger than that, there are resources all over the world that need protection that end up going into or through or from the United States all over the world. I made the leap to the US Fish & Wildlife Service because I wanted the opportunity to work on cases that would have a larger impact on resource protection. It wasn’t that the job of a uniformed conservation officer was unimportant. It’s very important. As a conservation officer, you focus on saving the resources of the state that you live in and [ensuring] the public safety of the people that are using those resources. That’s very important, and I don’t want to minimize it. I [simply] wanted the opportunity to work on larger cases that had a larger scope, and that’s why I made the leap to US Fish & Wildlife Service (FWS). Laurel Neme: One of the cases that you worked on when you were at the state agency, back in 1993, involved a Mexican Red-Kneed Tarantula for sale at a pet store. Your discovery then led to a major FWS case called Operation Arachnid. Can you tell me about that? Sheila O’Connor: I actually didn’t have a very big role in that case. I just found the tarantula in a pet shop and then turned it over to the feds. In 1993, I had received a complaint of illegal reptile commercialization. We sometimes call it "herptile" because it’s not just reptiles, it’s all different sorts of herps—it’s salamanders and amphibians and tarantulas that are all part of this "reptile" trade. Even though they’re not reptiles, they are very popular among reptile enthusiasts. Laurel Neme: Why are they so popular? Sheila O’Connor: They’re unusual pets. They’re alternative pets and they’re perhaps a bit harder to find. [At the time,] it was not all that easy to find a pet snake at a pet shop. It has become much more mainstream than it was in 1993. But there are people who do nothing but collect pet snakes. That’s their hobby and they spend a lot of money on it and they’re very dedicated to it. It’s the same with tarantulas. There are people that do nothing but collect tarantulas. So, as part of this complaint on illegal reptile commercialization, I started going in to area pet shops in my patrol area. I did not go in uniform. I just went in plainclothes to look around and see which pet shops might be selling what different items. The state of Illinois, as do most states, regulates the sale of native wildlife on a commercial basis. Whether that wildlife is bred in captivity or whether it is not, the states will tend to regulate that usually through the issuance of permits and filing of annual reports and periodic inspections. So, I was in an "intel" gathering phase, seeing what was going on in my area. This was an area I hadn’t really looked at closely before this complaint came in. I went to a pet shop that was in my patrol area and I saw this tarantula in an aquarium case. On the case there was a sign that said “first one out of Mexico in 3 years, prohibited by Mexican Government,” or words to that effect. Laurel Neme: What did this tarantula look like? How big was it? Sheila O’Connor: Tarantulas are pretty big spiders. It was the size approximately of the palm of my hand, so about 4 inches in length. They’re sort of circular, so they’re about the same all the way around. It was black and it was all hairy. 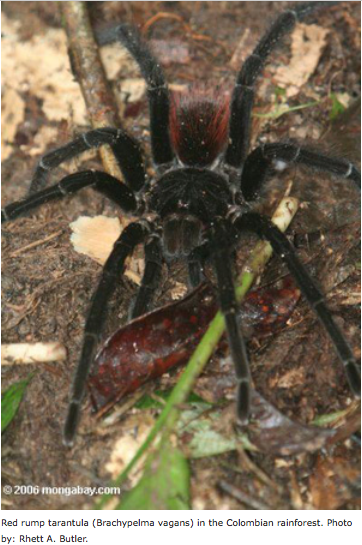 But its knees—they’re not really knees but the joints on some of its legs—had red hair, hence the name Red Kneed Tarantulas. I looked around the pet shop and saw some other things that were of concern to the state. Tarantulas, of course, are not native to the state of Illinois. So I went back to my office and I looked him up on the Endangered Species List to see if they were listed. The state of Illinois protects not only native wildlife but anything that’s on the federal Endangered or Threatened Species List. Well, they weren’t there either. But I knew that a violation had occurred. It said so right on the case—"First one out of Mexico in 3 years." That means that it was smuggled across the border in to the United States from Mexico. So I called the US Fish & Wildlife office in the Chicago area. I had worked agents there a couple of times before and reported it to them. One of them took up the case and, to make a long story short, ended up finding the supplier of these tarantulas and several other live tarantulas as well. Felony charges were filed against several parties and they were convicted in court. I don’t recall specifically what happened to the pet shop or what penalty they paid. They clearly knew the tarantula was illegal and they were prosecuted, I just don’t remember what happened with them. Laurel Neme: What happened to the tarantula? Sheila O’Connor: Whenever we can we need to keep animals for evidence. If they’re alive, we do our very best to keep them alive. The agent who was working this case had the ability to care for one of the live tarantulas and the rest were placed with other experts in the industry. We have to preserve them for evidence. This is our evidence for court. We can’t show up to court without evidence of a crime. The one that the agent kept he named Elvira—but we don’t really know if it was male of female. 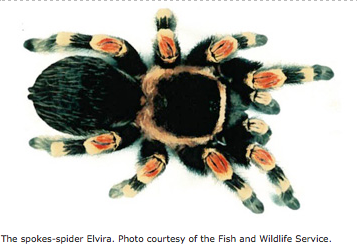 Laurel Neme: How do you tell if a tarantula is male or female? Sheila O’Connor: Your guess is as good as mine! I’m sure there are people out there who know that sort of thing but I do not know the answer to that. Laurel Neme: Elvira then became a spokes-spider, right? Sheila O’Connor: She did. The agent would bring Elvira to educational talks with school groups and others to educate people on the live pet trade—how not all of it is legal. Just because you see something for sale in a pet shop doesn’t mean it’s legal. It doesn’t mean it entered the pet shop or the pet trade legally. Plus, it’s cool! What fifth grade boy doesn’t want to see a tarantula in class? It’s an attention getter, for sure. Laurel Neme: Was the tarantula ever released or did it stay a spokes-spider? Sheila O’Connor: No. The tarantula stayed a spokes-tarantula! The problem with [releasing] live wildlife [back into the wild] is, when it’s been kept in captivity, we don’t really know its history or from where it was collected. We knew it came out of Mexico, and we had a general idea of what area in Mexico it came from, but once [an animal has] been subjected to captive conditions, a lot of animals are really not releasable back to the wild. They can pick up all sorts of diseases in captivity that, if they were released to the wild, they would spread to the wild counterparts—and then you could wipe out a local population, a regional population, or in some cases an entire population of an animal. The other thing, too, that biologists will tell you is that, unless you know the exact population that an animal came from, its really not a good idea to release it back to just a general population because there are gene pools. The same snake or turtle can develop different genes if it comes from one side of Lake Erie versus the other side of Lake Erie. They can become genetically distinct populations. So then just introducing one that came from Lake Erie—[you need to know] what part of Lake Erie? Maybe there are several different populations. [Otherwise you’d] mix gene pools. It sounds like a great idea—“oh let’s release this back to the wild and let it live its natural life”— it sounds like a great thing. And that is our goal when we have enough information to do that. But it’s rarely possible. Laurel Neme: So when something enters the pet trade illegally—even if it’s alive, even if it’s confiscated and saved—it’s not helping conservation. Plus it’s highly likely that it cannot go back into its population. Sheila O’Connor: Right. That [confiscated pet] is one [animal] that will not contribute to the breeding of new tarantulas, or leopards, or parrots. They won’t go back to the wild to live a natural life. The animal itself is deprived of living its natural life, and you also rob the population of different genes. Who knows what that individual could have contributed? Laurel Neme: Does a tarantula, or some of these other exotic creatures, make a good pet? Sheila O’Connor: Wild animals seldom make good pets. Number one: they are not happy in captivity and so they will be under individual stress. The difference between a wild animal as a pet and a domestic animal like a dog or a cat as a pet is that they—domestic animals—have developed a need for humans. Dogs and cats depend on their human owners to take care of them. If they were alive in the wild—if they were to be released from ownership into a forest preserve or a park somewhere—their life span [would be] very short. They need us to survive, and we have developed an emotional attachment to them. With wild animals, that’s not the case. They don’t need us to survive. So when you take an individual [animal]—let’s say a tarantula—out of the wild and put it in a captive situation, it’s not going to be living its natural life. I don’t want to assign emotions to tarantulas. I know very little about tarantulas. You can tell when a dog is happy or not happy. I don’t know if you can tell when a tarantula is happy or not happy. But that animal is going to be under stress. Number two: wild animals have unpredictable behavior. Even domestic animals can have unpredictable behavior, but we’ve come to learn the breed traits of golden retrievers and Himalayan cats because they’ve been domesticated for such a long time. But how do you domesticate a lion? How do you domesticate a bear? Those animals are unpredictable. Their behavior is unpredictable, and it’s particularly dangerous when those animals are predators like big cats and bears. Tarantulas are not human predators but that doesn’t mean they would necessarily make a good pet. Their behavior is still unpredictable. Laurel Neme: What is the role of a US Fish & Wildlife Service special agent? What laws do you enforce? Sheila O’Connor: US Fish & Wildlife agents are charged with enforcing the nation’s laws that protect our natural resources and animals—wildlife. That includes laws like the Endangered Species Act (which actually covers plants as well). [That Act specifies] certain things you can’t do with them. You can’t hunt [species listed in the Act], for example, the way that you can hunt duck when they’re in season. You can’t buy and sell them. You can’t import and export them without special permits, and even then it’s pretty tough. So, we [as FWS Special Agents] enforce things like the Endangered Species Act. We also protect wildlife all over the world through the Endangered Species Act. Going along with the Endangered Species Act is an international treaty nicknamed CITES. It’s the Convention on the International Trade in Endangered Species of Wild Fauna and Flora. Again, these are species that have been identified all over the world as being at risk on one level or another through illegal trade—through illegal harvest. The United States is a signatory to that treaty, and so we would protect animals like African elephants, Asian elephants, and primates. Every primate, no matter where they are located in the world, is protected under this treaty. All crocodilians (e.g., alligators, crocodiles and caimans) are protected under this treaty, no matter where they are at in the world. So we would enforce those laws. We would enforce the Lacey Act, which basically means that if you commit a wildlife crime in one state and transport the fruits of that crime to another state, it becomes a federal offense. So, if you go deer hunting illegally in New Hampshire, and you poach a deer in New Hampshire and then you bring it back across the state lines into Vermont, it’s now a federal crime. It’s no longer just a state crime. This is one way that we regulate animals that are not normally protected under federal law, is that if you cross state lines [with the illegal animal] it becomes a federal law. There’s also the Migratory Bird Treaty Act (MBTA). We enforce that. That regulates things like duck hunting, goose hunting, and the illegal take of birds. For example, you can’t hunt songbirds. The importation and exportation of migratory birds [is not allowed]. That’s set out in the Migratory Bird Treaty Act. We [the US Government] own a lot of properties called National Wildlife Refuges and there are laws set up to protect those areas as well. You can fish, boat and hung in some areas and can’t in others. We enforce those laws. There are a couple of the lesser-known laws that we enforce that deal with Native American artifacts such as the Archaeological Resource Protection Act. Basically, if you collect Native American artifacts off of federal property, it’s a federal crime and we can investigate that. It does have an impact on our resources because those are a lot of times dug off of federal property. Let’s see, what else? We enforce the Wild Bird Conservation Act, which is an act that’s set up specifically to target the protection of birds coming into the United States from other countries, and the Rhino-Tiger Act, which is aimed at protecting rhinoceroses and tigers from illegal commercialization, mostly in things like the medicinal trade. Laurel Neme: The Rhino & Tiger Conservation Act is unusual because you don’t have to prove that a product actually contains rhinoceros or tiger for it to be an offense. Sheila O’Connor: Right. It just has to be labeled or advertised as containing it. For instance, if the labeling on the package claims [the item] contains rhino horn, then it’s a violation. That may not make sense to some people but I’ll explain why that law exists. There is a big demand for medicinals that contains different kinds of wildlife, including rhino and tiger. People will buy those products if they think that rhino and tiger parts are in them. That leads to the killing of rhinos and tigers to supply the medicinal trade. Even if the box that you’re buying off a shelf doesn’t actually contain rhino, it creates a demand for it. So, somewhere out there in countries where rhinos still exist, people are trying to poach—kill—rhinos illegally to sell their parts. The Rhino-Tiger Conservation Act is an attempt to specifically shut down the trade, or the advertised trade, in rhinos and tigers—to give them extra protection because they are so critically endangered right now and they’re disappearing very quickly. These animals don’t live in the United States in the wild. They live in foreign countries in the wild. We have no control over how well other countries enforce their wildlife and customs laws. There is big, big money in this! That’s why people do it. Laurel Neme: What kind of money are we talking about, say for rhino horn or tiger bone? Sheila O’Connor: It mostly goes by weight, and it can also sometimes go by what country it comes from. I’m not an expert on Asian medicinals, but generally rhino horns they’re very, very valuable. I weighed one that we had in the office. It weighed about four pounds [and] was probably right around 12 inches tall from the base to the tip. That was worth about $100,000, or roughly $25,000 a pound for rhino horn. Other parts of rhinos are also utilized: the bones, the skin, the toenails. I’m not sure what the value is on those parts. But in some cultures they believe that rhino medicine can cure cancer. Tigers have two markets. There’s a dead tiger market and there’s a live tiger market. Sadly, dollar-wise, not environmentally but dollar-wise, tigers are more valuable dead than they are alive because they can be sold in parts and pieces. The hide has a value for things like trophies. People want to hang tiger skin rugs on their walls. So, there’s a trophy value for the skin. Then the bones have a value, the whiskers have a value, the claws have a value, and the organs have a value. When you disassemble a tiger—when you kill a tiger and sell it off by part—you can make more money than if you were to sell one live as a pet for example. Those are illegal, by the way. A live tiger might only sell for something like $5,000 to $8,000, depending on its color. Live white tigers will easily sell for $50,000 on the black market. A dead tiger though, just a regular old, nothing special tiger—the figures that I have are more than ten years old, and they are $70,000 to $100,000. There was a tiger skeleton that sold for around $100,000, I think it was about 25 years ago. Laurel Neme: That’s when more of them were around, so presumably the price has gone up? Sheila O’Connor: Not many more! Tigers were endangered even back then, when this was sold. It was a black market sale of course. When there is no more of something, then the remaining individuals become more valuable. That’s just supply and demand. Tigers and Rhinos have been poached to the brink of extinction, and that’s why the Rhino-Tiger Conservation Act exists in the way that it does, where we don’t actually have to prove that it contains rhino or tiger. We just have to prove that someone claimed it did or that it’s labeled as containing that because that trade in and of itself is so harmful and so detrimental to the survival of the species overall that it’s a big deal. It’s a big deal and the law reflects that. Laurel Neme: Are there other species where you don’t have to prove that it actually is that species (like rhino horn)? Sheila O’Connor: Anything listed on CITES. The CITES treaty that we talked about earlier is written in the same way to allow for that. If it is labeled as containing or claims to contain a CITES protected species, then it’s to be regulated in that way. So again, this is something that is relatively new for the Fish & Wildlife Service and we, I believe, are still in the process of changing our regulations to reflect that, but that is true. Anything protected by CITES can be handled in the same way where the claim or the labeling that it contains a CITES-listed species is good enough for a criminal investigation. Laurel Neme: Wow! That’s interesting. Sheila O’Connor: It is. And that’s largely untested in the U.S. courts. I’m not sure if any cases have actually come before United States courts that are based on a claim. Obviously, it’s a much stronger case if we can prove that it actually does contain pangolin scales, or whatever the label suggests. On the other hand, it’s a reflection that so much wildlife is threatened by illegal commercialization all over the world. Laurel Neme: What is one of the more interesting cases that you’ve worked as an agent? Sheila O’Connor: I did have a case involving the illegal sale of live endangered species. A husband and wife team that lived in Minnesota were buying and selling live animals. Some were not endangered but many were, and they were selling them. 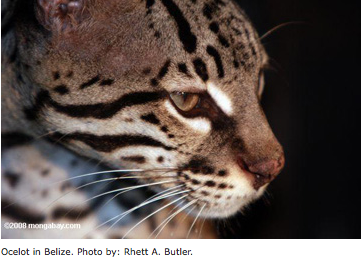 They had an ocelot, and they were buying and selling leopards, tigers, and grizzly bears. Laurel Neme: Where did they get those animals? Why did they have them? Sheila O’Connor: They had them illegally from other breeders in the United States. Our investigation never showed that any of them were illegally imported from other countries, as far as we know. But there is a thriving trade in the United States, and if endangered species are being sold across state lines, it is almost always going to be illegal. There are special permits that can be obtained from the US Fish & Wildlife Service, but very few people have those. [Plus,] people who [do] have [those] permits have to show that their activities enhance the survival of the species in question. [Permits do not provide] a blanket authority to buy and sell a snow leopard. You have to show that your activities are actually contributing to the survival of snow leopards in the wild. But again, there’s a lot of money to be made. Every time you see a commercial, or you go to a shopping mall or a car dealership or a county fair anywhere in the United States and you see tiger cubs—“come on in and have your picture taken for a mere 25 holding this tiger cub”—odds are that tiger is in the trade illegally. Reputable facilities like AZA-accredited zoos do not allow that to happen to their tigers. They are generally on display, yes, but they are well taken care of and they are not in the animal trade. The idea is that certain zoos are holding these unique individuals for the purpose of someday contributing to breeding programs that would release them back into the wild. [In contrast,] these private back yard breeders, they’re not engaged in anything like that. They’re engaged in profiteering. We have records of some people who will allow hundreds of people to come in over the course of a weekend and handle seven-day-old tiger cubs. There’s a risk to the tiger. There are tiger cubs that have died from this type of activity. It’s hot, they’re being handled too much, they’re perhaps becoming dehydrated—I mean would you hand your seven-day-old infant to 500 people in a weekend? Laurel Neme: No. Absolutely not. That’s a good point. Laurel Neme: How did you detect this case? How did you come upon that couple? Sheila O’Connor: A tiger on the facility attacked a child, and the parents of the child eventually contacted the US Fish & Wildlife Service. 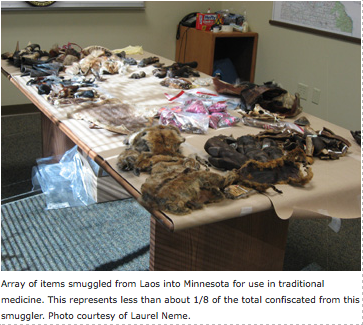 We started an investigation and were able to determine that the husband and wife team were regularly buying and selling live endangered species in interstate commerce. We then built a case against them and they both went to prison over it. They’re both convicted felons. Laurel Neme: Did the facility close down? 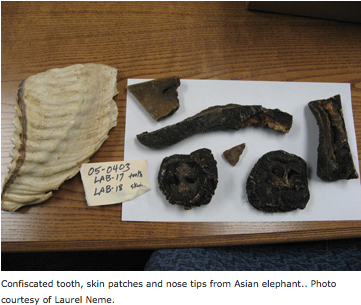 Laurel Neme: Can you tell me about the recent case of illegal wildlife parts being used for traditional medicine among immigrants from Laos? Sheila O’Connor: The investigation goes back to about 2005. A mother-daughter wildlife and drug smuggling team were living in the Twin Cities (Minneapolis-St. Paul). Both had been born in Laos and then immigrated to the United States in the 1980s. The mother would go back to Laos, where she would obtain parts and pieces of different kinds of wildlife, the bulk of it endangered, threatened, or protected by CITES (this international treaty). She smuggled it back to the United States, where she sold it at a flea market in St. Paul. We caught her as she came through the Minneapolis-St. Paul Airport. US Customs and Agriculture found her during what is called a secondary inspection. Anyone who’s traveled internationally, odds are, if you haven’t had a secondary inspection yourself, you’ve seen someone else go through it. They pull you aside, open up your suitcases and physically check to see what your bringing back into the United States as compared with what it says on your Customs declaration. Laurel Neme: What about her triggered the closer inspection? Sheila O’Connor: She had a bunch of plant material, so she was sent to Agriculture so that the agriculture inspectors could look at the plant material that she was bringing back to see if it contained any seeds, agricultural pests or diseases. Sometimes people will bring citrus products back from Southeast Asia and they can have citrus funguses and cankers and stuff that can spread to the citrus crops here in the United States and cause huge amounts of damage. That’s one of the things that Agriculture checks for. Well, they took out one of the bundles of plant material and found wildlife—bones, pieces—and called our wildlife inspector at that airport, Linda Benson. Her supervisor also happened to be there that day, and the two started going through the bags and they found eventually almost 1,400 pieces of individual wildlife; all kinds of species like elephant, douc langur (which is a primate), slow loris (which is also a primate), and porcupine quills. There were strips of animal hide, but we had no idea what [species] it might be. They seized everything and contacted me. I went over there, we looked at it, and we got some preliminary identifications. [FWS wildlife inspector] Linda Benson found out through the woman’s son that she was selling the items at a flea market, and got the location of the flea market. I went there a few days later and saw that much of the wildlife that was seized from this woman three days prior was still for sale in her shop. So we started a criminal investigation into this woman. At the time, we didn’t know anything about the daughter. As the investigation progressed we found that the adult daughter was involved. By the way, the woman had also smuggled steroids back into the United States. She had a fabric belt that was sewn from traditional cloth, and on the inside of the belt (the part that would be facing the skin) there were 141 little pockets sewn and each of those pockets contained a vile of anabolic steroid. This was at the airport. The sash was then wrapped up in a ball hiding the vials on the inside, was stuffed in a wooden canister, and then it was buried in one of the suitcases. That was not declared. None of the wildlife was declared. None of the drugs were declared. That’s what led to the overall investigation of this woman and her daughter and their business. We made a couple of undercover buys, sent the materials to the [USFWS forensics] lab, and confirmed that it was things like serow (a wild animal, about the size of a goat but it has antelope-like horns). Serow is CITES Appendix 1 and also endangered. Appendix 1 is the highest level of protection. You cannot commercialize Appendix 1 species. [Other animal parts found included] leaf monkey, a giant squirrel, a clouded leopard bone, and these salamanders that had only been discovered in 2002. Prior to this, scientists did not know that Laos even had salamanders! We seized 120 of [these salamanders]from her during the course of the investigation. 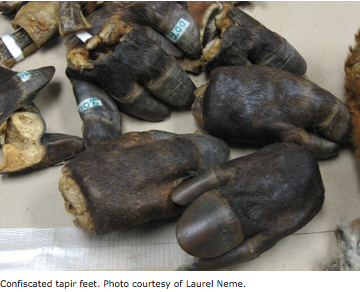 [We also found parts from] tapir, which is another CITES Appendix 1 animal. It has a pig like hoof, except it’s got three toes, whereas pigs only have two. [There were] just tons and tons of really endangered, protected stuff that she had been smuggling into the United States. Laurel Neme: What did she use it for? Sheila O’Connor: Medicine. We learned [some of the uses] during the course of the investigation. [For example,] she was bringing back Asian moles. They’re not endangered or anything like that. But they were terribly dried and desiccated. There was no fluid left in these things; they were crumbly. One of the things we learned about the use of that is, when a woman goes into labor, you cook these moles in water and the pregnant woman drinks the water. That is supposed to help with labor. I’m not sure if that’s supposed to speed labor or if it’s supposed to ease labor pain, but this is very popular medicine in this Laotian refugee community in the Twin Cities. It was very well known that the Asian mole helps with labor. We were [also] finding these strips of dry elephant hide. You could see the skin on the outside and the layers of the dermis underneath. They were also very dry. You could see the hairs [on the strips]. Elephants have black bristly hairs that are very wiry and they were still sticking out of the skin side. One of the things we learned is that you can cut pieces of this dried elephant meat, and grate it (like with a cheese grater) and cook it in water and then wash a person who’s had a stroke with this water, and that’s supposed to help a person recover from a stroke. We obviously have no evidence that this works, but for the US Fish & Wildlife Service, the investigation was never about whether these remedies work or don’t work. The investigation was always about these endangered animals, and whether they were coming into the country legally and what was happening to them afterwards. We discovered that they were being smuggled in and they were being commercialized. Laurel Neme: How many animals did this case involve? Sheila O’Connor: One of the things I asked the [FWS forensics] lab to do was to try and tell me the number of separate individuals [because]. The court wanted to know how many individual animals this represented. Based on the different times when the animals were imported, and also just the sheer numbers of things that we had, we were able to determine that with the serow, for example, she had enough horns and skull plates to account for 17 different individual serow animals. The lab can tell this is a right horn, this is a left horn, and we asked them to do that. Now the actual number could’ve represented far more than 17, but the court wanted to know the basic bottom line number of animals of each species that we could document for certain. We came up with three Asian elephants, based on the different times when she imported the elephant parts. It’s very unlikely that you would import elephant parts from the same elephant on three different occasions. Like I said earlier, [she had] 120 dried, desiccated salamander bodies. I think it was 120 also on the Asian moles. One clouded leopard was all we could ever establish. One Asian golden cat. That’s one of the things I asked our forensic lab to do, was to help me determine a bottom line number for the court, knowing that we would have to explain to the court that these numbers could actually represent a far larger number of animals. Laurel Neme: And that’s just one person, or two if you consider her and her daughter, that illegally imported so many animals. Sheila O’Connor: Right. And we found more steroids, too, that she was just selling over the counter. She was selling them at her booth over the counter with a price tag on them; no prescription. Part of the danger of people who do things like this is, you go into this booth and you tell someone your symptoms, they diagnose you with a disease and prescribe a treatment with no medical degree. I mean, that’s how it works in this country. You need to be a doctor in order to diagnose ailments and prescribe medications. One of the hazards when you’re selling anabolic steroids over the counter is nobody’s regulating that. Nobody. Are they being taken medicinally? Are they being taken by kids who want to bulk up? Who knows? She wasn’t keeping any record of that sort of thing. Laurel Neme: What happened to her after the case? Sheila O’Connor: Both her and her daughter were indicted on felony smuggling charges. They were both convicted. The daughter paid a fine. Sentencing is not necessarily a straightforward thing. Judges take all sorts of things into account, including the risks that a person will reoffend. In the case of the daughter, who was in her 30s, the daughter had a job at a major U.S. company. She had children in the school system. She was married. The risk that she would reoffend based on her background and based on her cooperation with the investigation as well was very low. So she paid a fine but she didn’t go to jail. The mother continued to offend even after she knew she was under investigation. She continued to have endangered species illegally imported to her and sell them at the flea market, even after she knew she was under investigation. After we served a search warrant on her, for example, she switched booths and continued to have wildlife sent to her that she sold at the booth—including more salamanders and tapir parts and perhaps some other things that we never caught. So she was penalized more harshly. This is a woman who, on paper, was 86 years old. She was sentenced to 6 months in a half-way house, which is very unusual. Think about what it would take for a judge to send someone who is 86 years old and doesn’t speak English away from her family to a half-way house, which is a form of incarceration. It’s not federal prison but you’re not free to come and go as you will. All your activities are monitored. She was separated from her family. She didn’t have the financial ability to pay a fine, so she wasn’t fined, but the judge imposed all sorts of restrictions on her as part of her sentence. For example, the judge gave us the authority to search her domestic mail packages over a certain weight without a search warrant. That’s very unusual. Normally if police want to know what’s inside a package that’s in domestic mail, they have to go get a search warrant and have to tell the judge “here’s what we think is in the package and here’s why we think it.” Because this woman had so much illegal wildlife mailed to her, the judge said “nope, if it meets certain criteria, you don’t need a warrant. Just go ahead and open it to see if it contains wildlife because this is part of her pattern and there’s a high risk that she’ll reoffend.” So we got that. Part of her sentence is she had to help us make educational materials, and we worked on that with her. She was also prohibited from owning, sponsoring, or working at any kind of flea market, no matter what they were selling. She was prohibited from selling any kind of merchandise whatsoever in a flea market or booth-type setting, including things like a food stand at an athletic event, like a soccer match at a local field. She couldn’t set up a booth there and sell food even. Those were some the restrictions that she had in place. She is still on probation, which means that her activities are still monitored by a probation officer who is an officer of the court and a federal law enforcement officer. She can’t leave the state, for example, without getting permission from her probation officer. We still have the ability to search her packages until she’s off probation. It’s a way of following up with convicted criminals to make sure that they don’t go back to their old life of crime.